It’s taken me a long time to realize what you have all know for awhile. It seems KnitTogether has run its course. I don’t even know why. 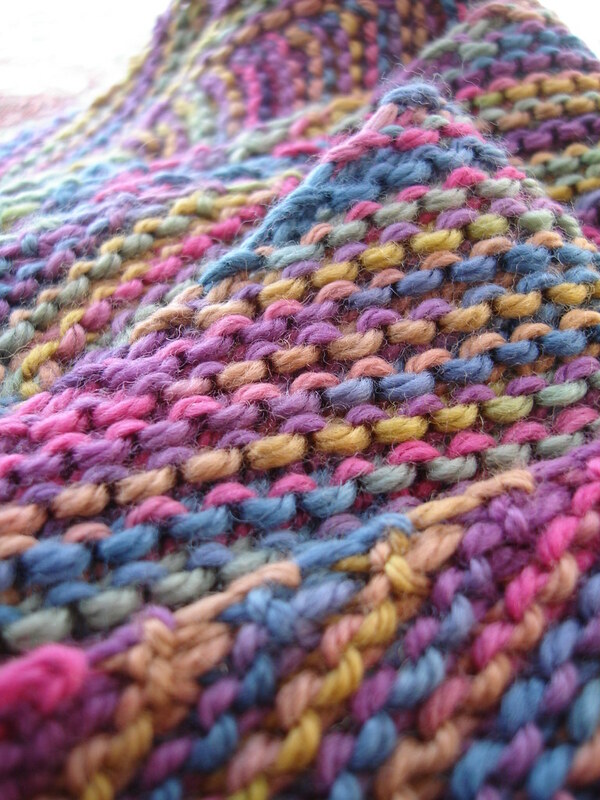 I’m still knittng, I still LOVE knitting…. I’m still reading ALL your blogs, even though my commenting has slacked off. Somehow, I’ve become a blog slacker. So…. It’s goodbye and THANK you, at least for the time being. I’m fine – I’m great. I’m still busy, as usual. I still think of things I want to say to you all from time to time. See… it’s because you are all my REAL friends. Really, I love each of you and thank you so much for spending the last few years with me. I’m SO glad you’re still blogging, because I’d miss you so. And, it means a lot that you have missed me to. So much, that when one of you would comment to see what’s up and where I’ve been… I keep telling myself I need to really make a thoughtful reply and tell you, Thanks, It means a lot…. and so I’d put it off until I had time to “make a thoughtful reply,”…. and hours turn into days, and days into weeks…. and so forth, and I’ve neglected you all. 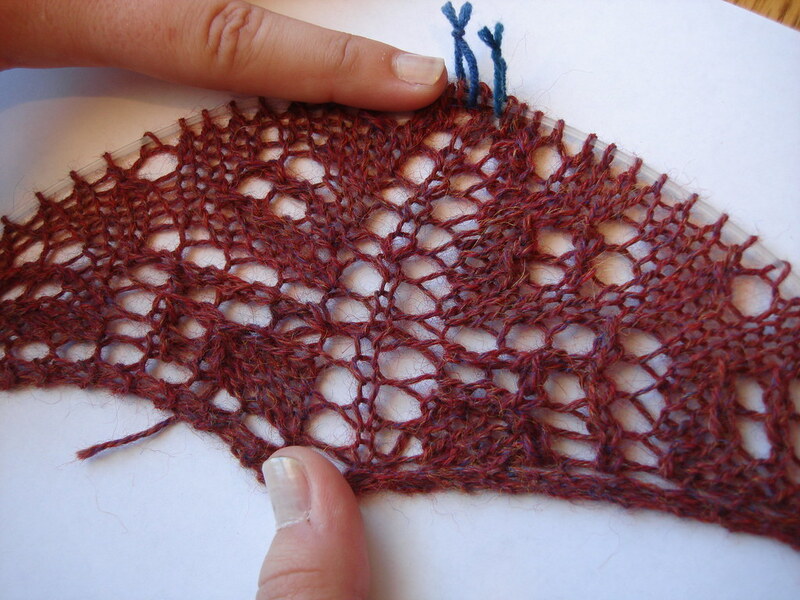 So, rather than neglecting you – I want to thank you so much, for being my friends, for being my knitting mentors…. I learned to knit from all of you, and I’ve made some of my dearest friends here…and I will always cherish that. AND, most important, I still know where to find you, so I’m not really gone, and you’ll still hear from me. 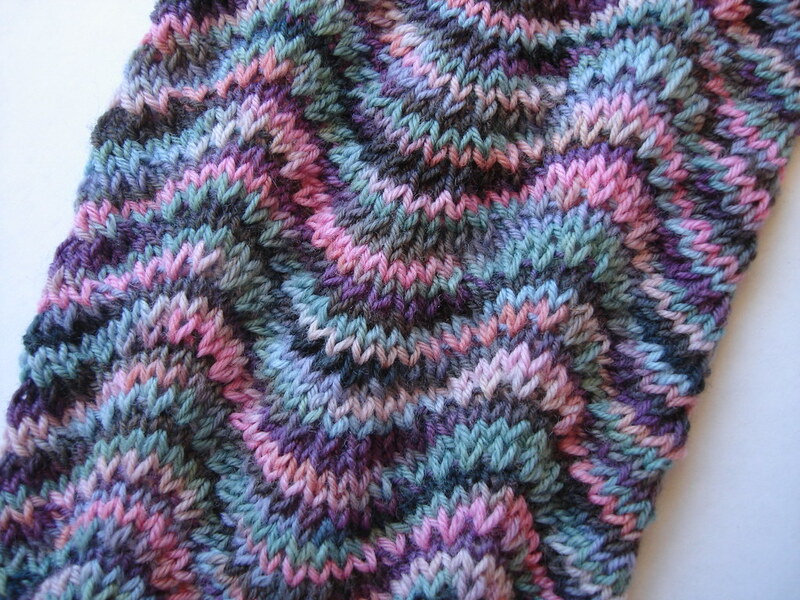 I’m still on Ravelry, so you can see the knitting there… I’m KnitTogether if we haven’t hooked up there, yet. And, I’m on Facebook. That I can do – think up one-liners about what I’m doing , and I’ve found some of you. and would like to find ALL of you there… so PLEASE email me if you want to Facebook with me, and I’ll tell you where to find me. 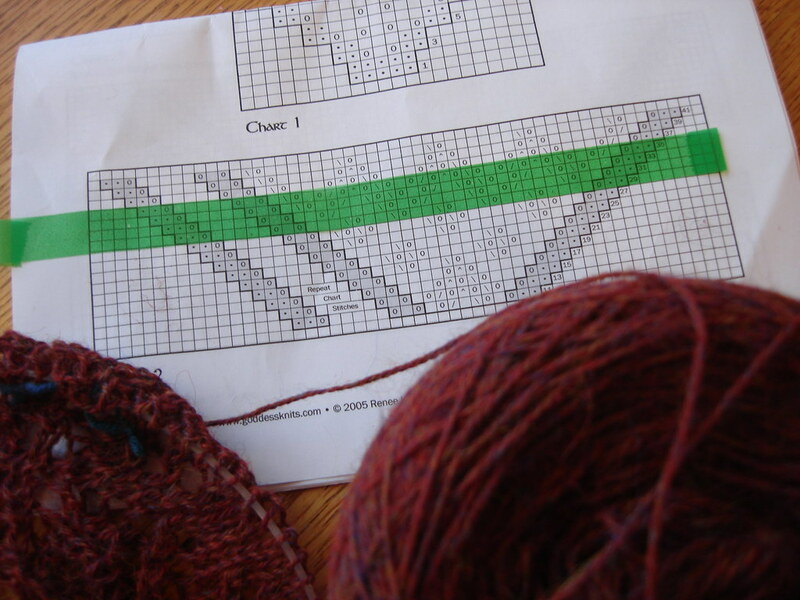 I’ll leave you with the last FO for this blog… a multidirectional scarf, Lorna’s Laces Worsted in Motherlode…. This is really hard – you have all been truly knit-together into my heart. And, now I’m feeling mushy and sad that I really just said this is it for the ol’ blog… but reality is, well reality… I’ll be a better commenter and you’ll all still hear from me. You really can’t get rid of me THAT easily! PS, remember to email me (lvonrader@inbox.com) if you want to keep in touch on Facebook. I get the one by the window – good knitting light, and a window sill for my important stuff – knitting tools, a place for my Diet Coke, and my girafe, Melman, to hold my reading/knitting glasses. 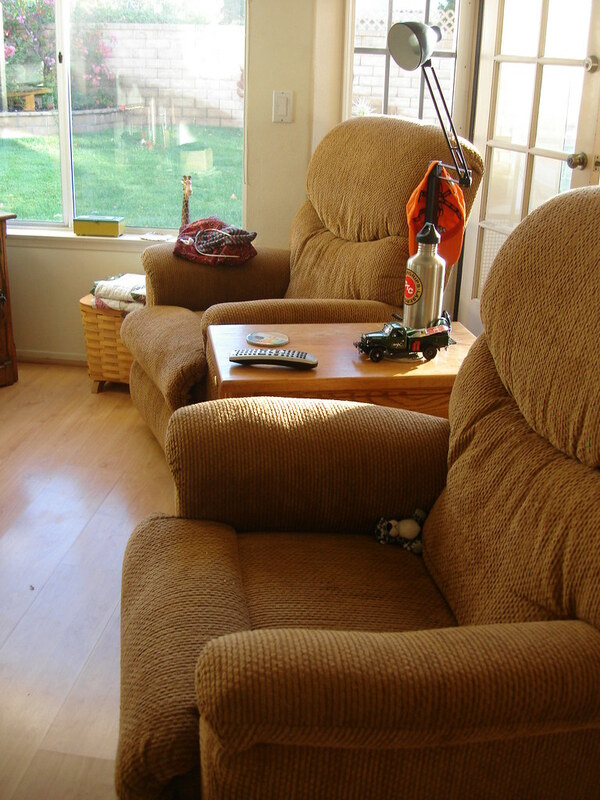 Hmmm, recliner, knitting glasses, and I do seem to be falling asleep a lot in front of the TV at night… Eh – so what, I get a bit of knitting done there, too, and it makes a nice lap for the dog…. and I’ve got the DVR so I can go back later and watch whatever TV show I nodded off to. I’m likin’ it! 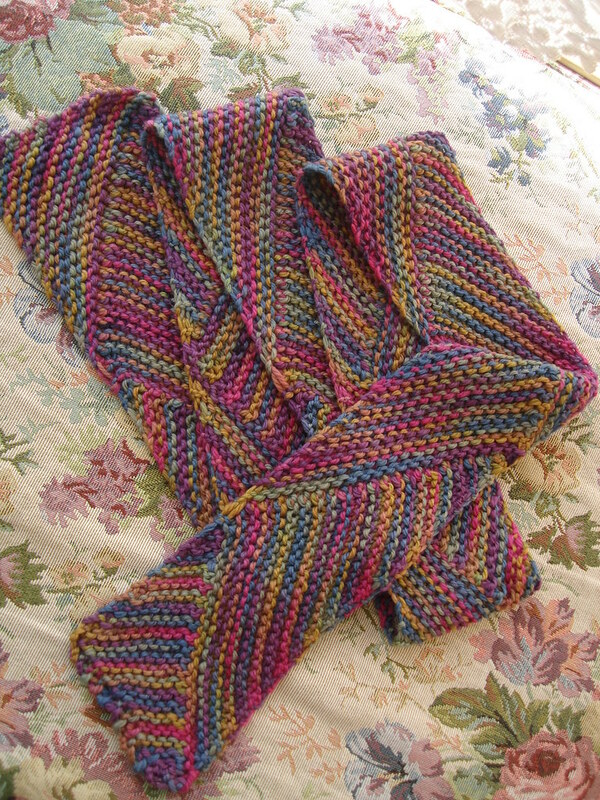 Everyone’s favorite “Chevron Scarf” from Last Minute Knitted Gifts. Lily has claimed this one for herself. (It’s got pink in it!). 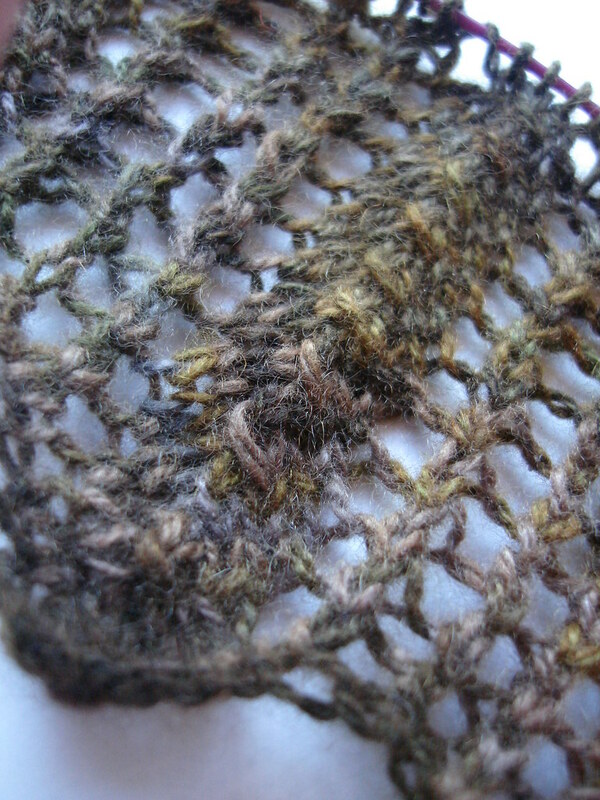 I’m using some leftover sock yarn, I think Lorna’s Laces Black Purl and Somerset. It’s the perfect, just interesting enough, just mindless enough pattern for TV and car knitting. Well, off to finish work, then I think I’ll recline. We had a big weekend, a couple of nice celebrations – Lily’s boyfriend’s Eagle Scout Court of Honor, and the bud’s birthday/graduation party. Thanks for the well wishes for his interview and birthday. He’s got grown up decisions to make in the future…. he’s also finishing up his EMT classes and is seriously considering going on to paramedic and continuing his Search and Rescue work, and holding off on the police thing for a couple of years…. 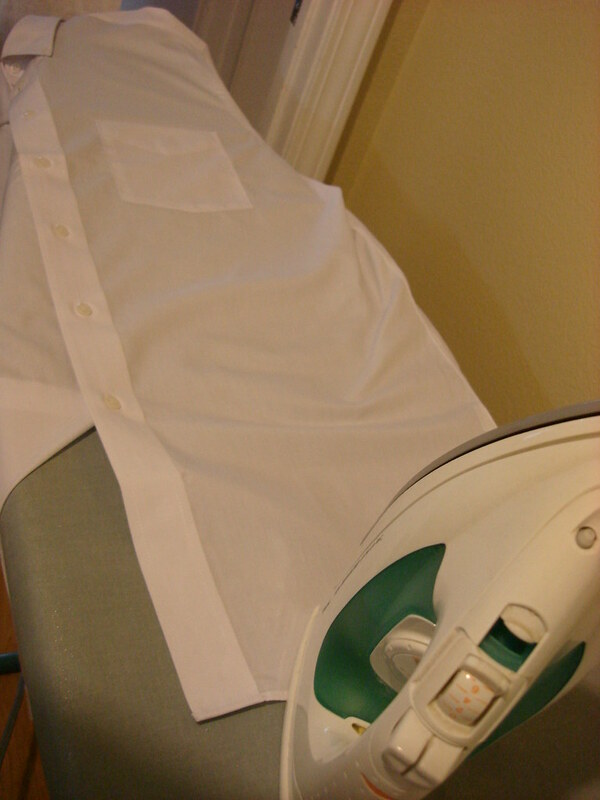 My firstborn turns 23 today, and I find myself this morning ironing his first white dress shirt for his first “real” job interview. He’s been working for years, but just graduated from college, with 2 degrees, and is ready for the “real” world. Today, he goes for a “real” interview, with a real police chief, for a job with a real police department, as a real police officer. He’s very excited and not at all nervous. I’m very excited and a little bit nervous. He’ll do well. He’s come very far. He’ll go even farther. Knitting? Oh yes, I still do. In fact, I don’t really finish many projects lately, but I do start them. Yesterday I was torturing myself, wanting to cast on for a new shawl with my Moab yarn, but really wanting to work on and finish my Twist sweater so I can wear it this winter. 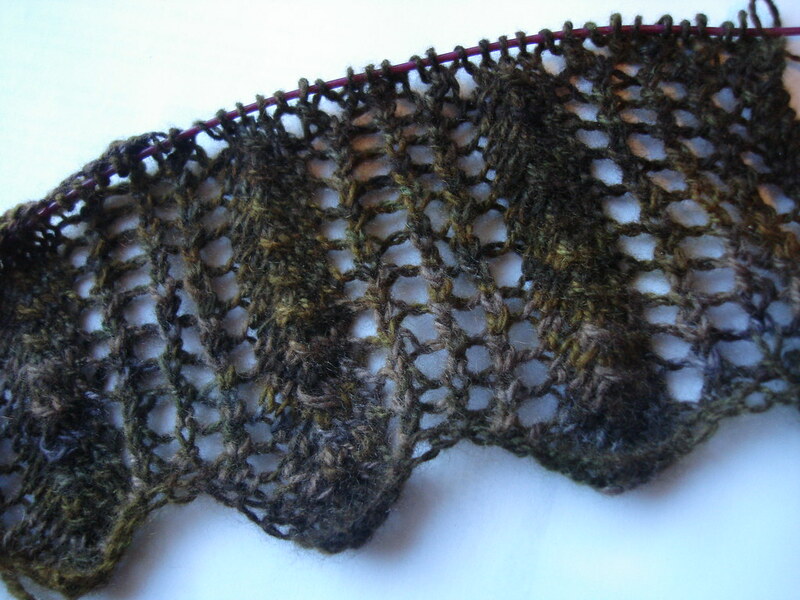 But, I’m feeling the cable knitting at the moment… so, of course, I cast on for the shawl. I have no self control. D#1: Well, Okay, but just don’t use your Incredible Hulk strength and get all out of control, because I don’t want you to ruin it. …hee, I didn’t even know one of them had Incredible Hulk strength. And, I don’t remember the last time I checked my sleeves for stretchability… is this important? I have seriously weird children. Oh, sorry, I got side tracked. Anyway, this Highlighter tape has some serious coolness factor… love it. Get some, especially if your like me and easily lose your place while doing ALL of your knitting lately during marathon sessions of my new favorite show of all time – 24. (and, yes, I may be in love with Jack Bauer, and we’re only on Season Two). 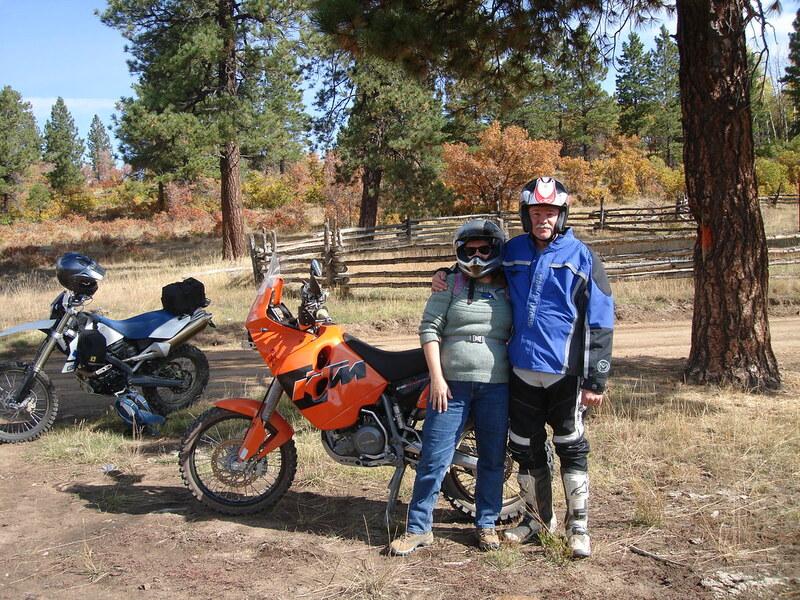 … for a week, just the hubby and I! Where have we been? 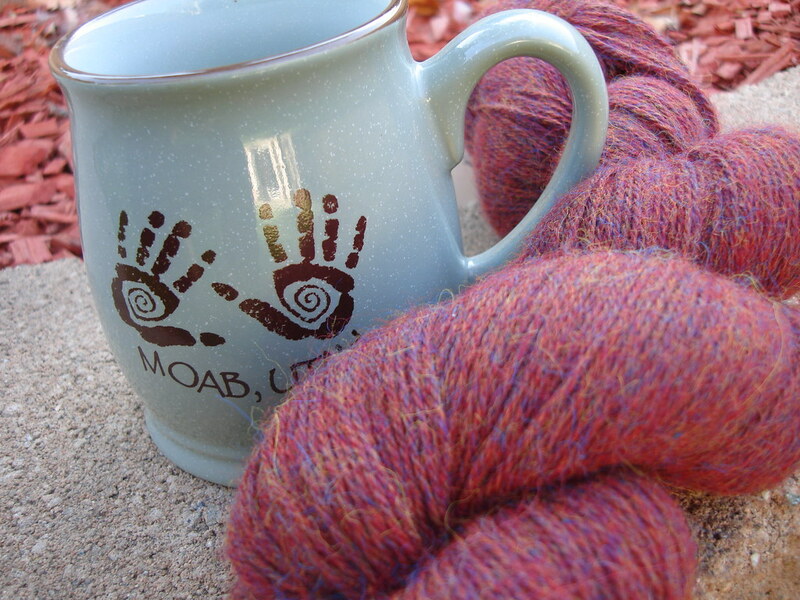 I bought some beautiful laceweight alpaca to remind me of the colors of Moab. 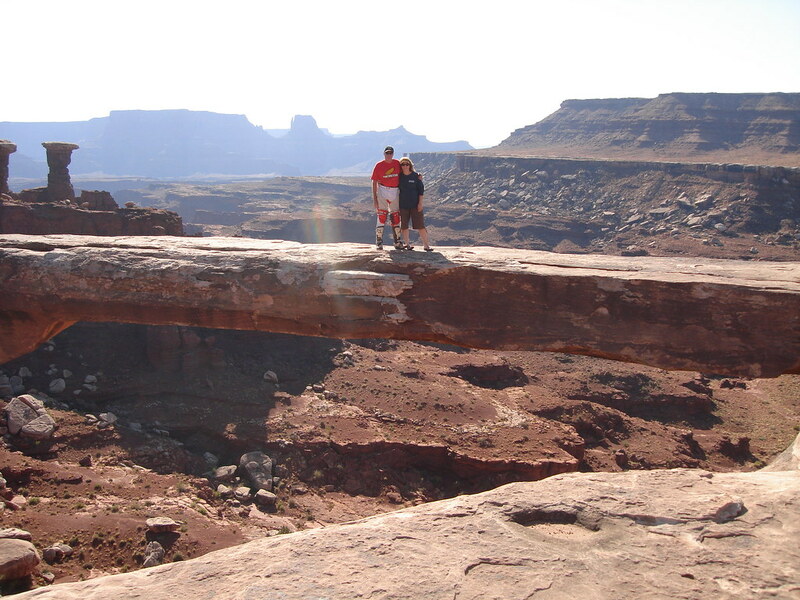 … and check us out standing on Muscleman Arch! It’s about 8-10 feet wide, and WAY FAR DOWN if you fell!! We had such an awesome trip. We’re already planning to go back next year. Oh yes… I did not knit a stitch all week while we were gone. 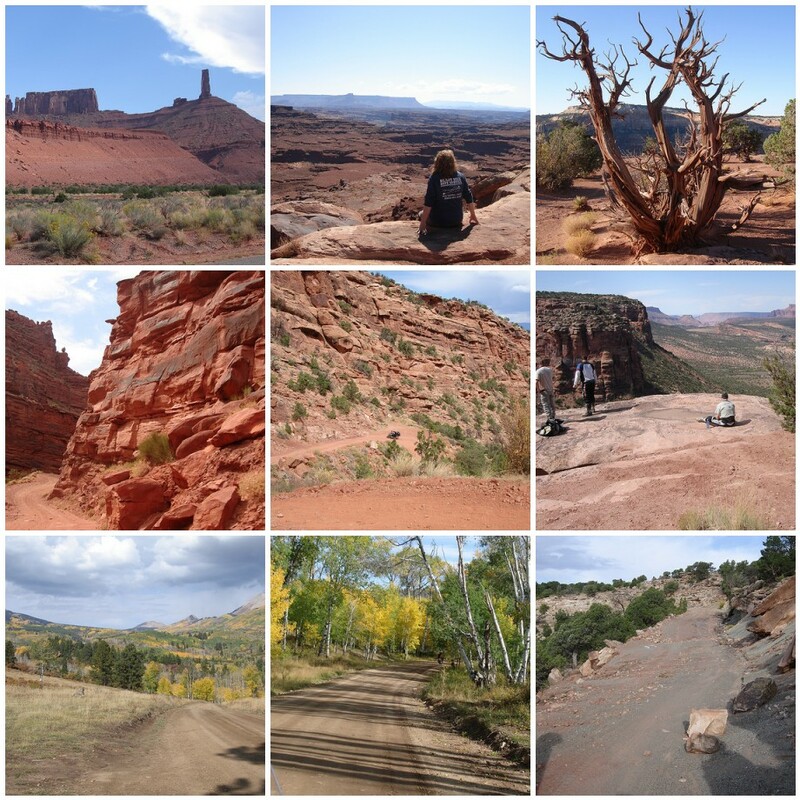 I had visions of knitting on the 800 mile drive (each way), but gawked at the scenery and enjoyed the hubby’s company instead. Didn’t miss the knitting a bit – but I can’t wait to pick it up again now that we’re home! 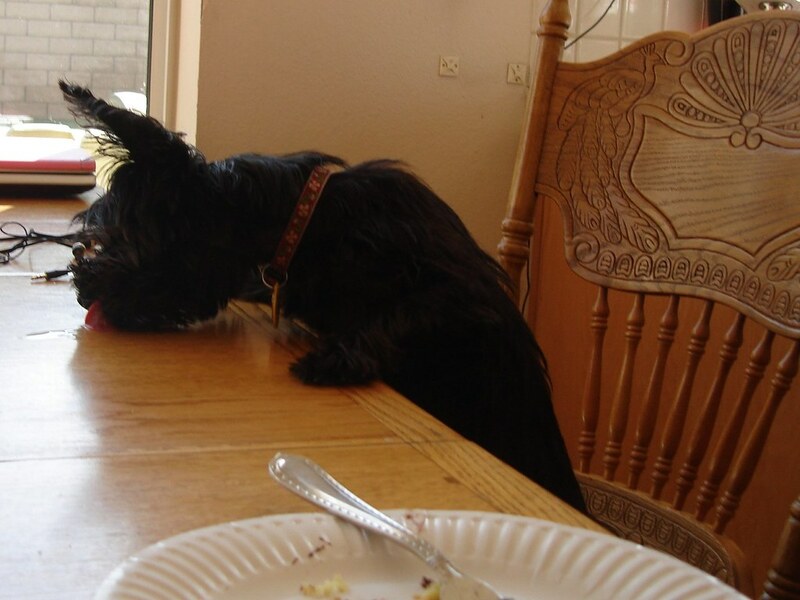 What is this dog doing sitting at the table? 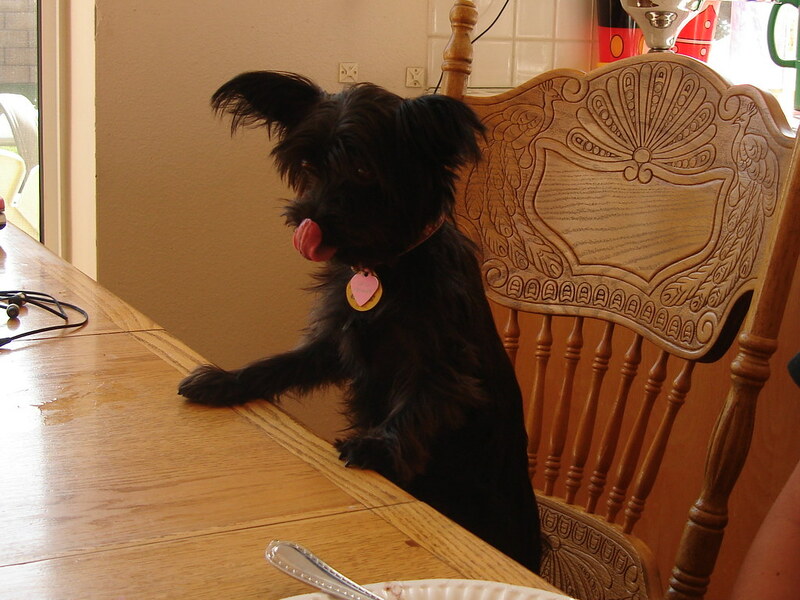 And, what is that wet mark on the table in front of her?? 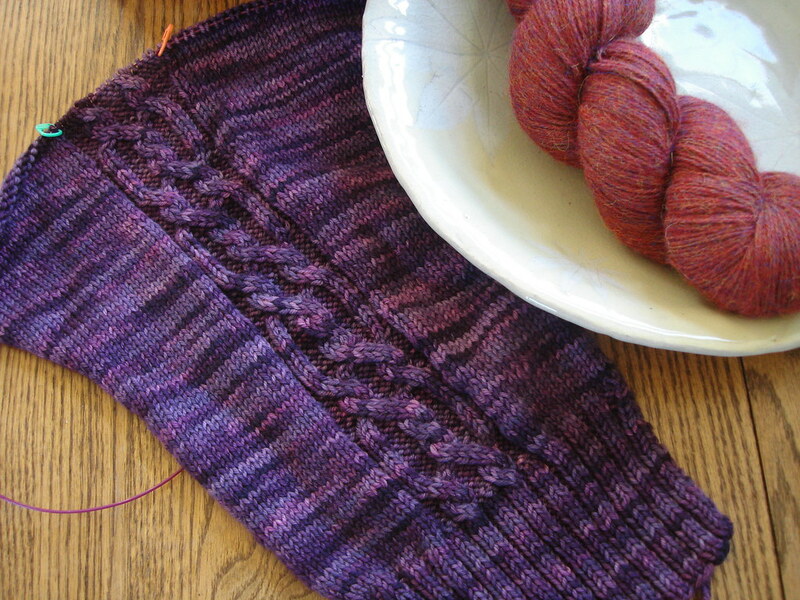 In knitting news – I cast on for Waves of Grain from the most recent Knitty! Aren’t the subtle colors pretty? 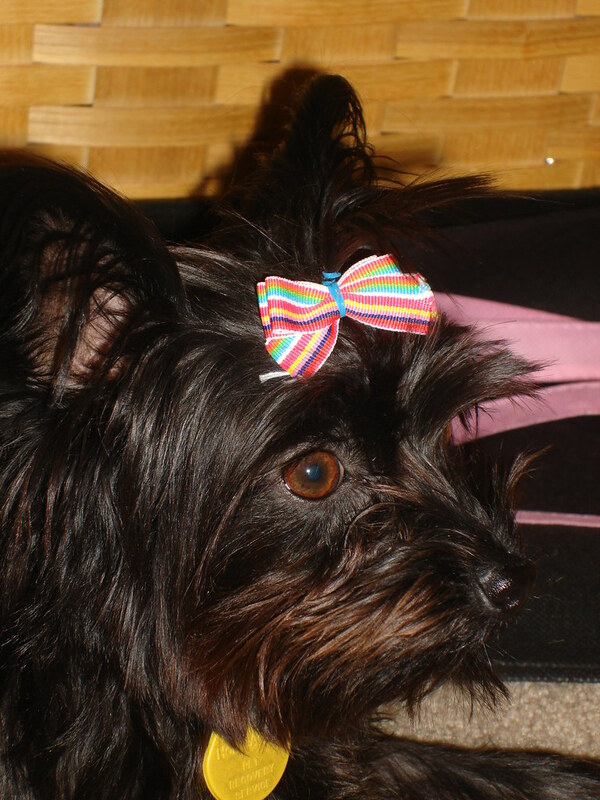 Ok – well, I’d better go check and see what the dog (and kids) are up to!